Do coats and shoes fall out of your closet when you’re trying to get out the door each morning? Okay, so it’s probably not that bad, but odds are yours needs a little tidying. 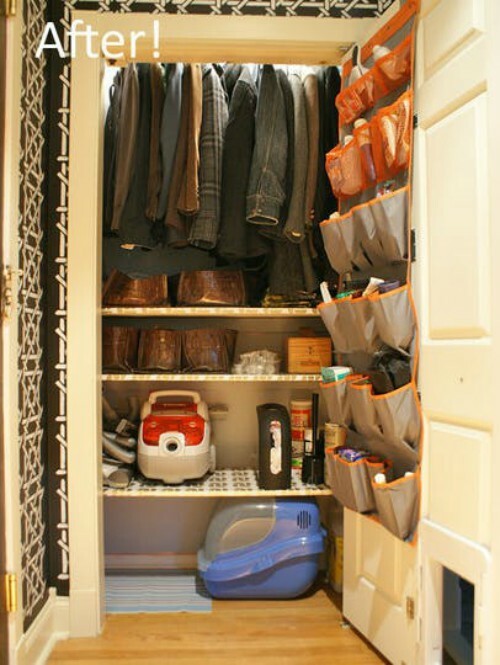 These coat closet organization ideas will show you how to organize your shoes, coats, accessories and more to make your in and out routines easier. Check out our mudroom ideas if you have an entire room dedicated to your entry. 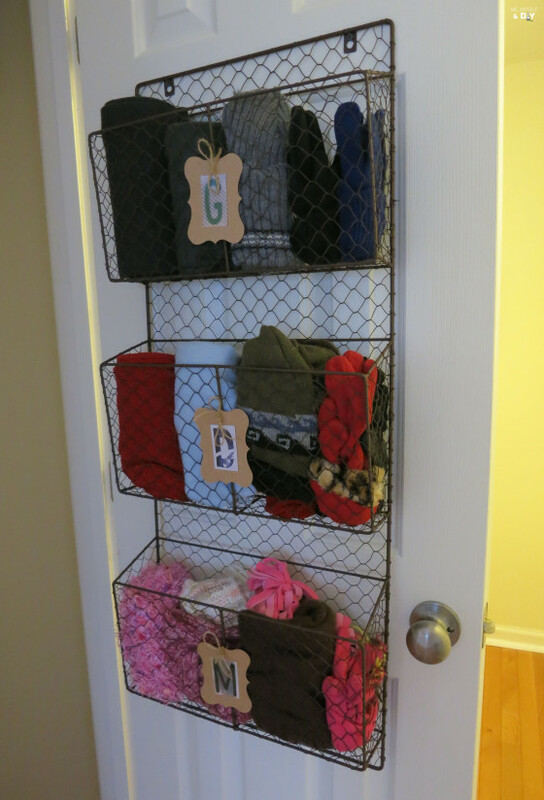 Add wire baskets to handle incoming and outgoing mail if your coat closet is right by your door. The purse hooks were another genius idea for this space. It’s great for keeping purses, lunchboxes, backpacks, etc. off the floor. Don’t forget a coat closet rug to catch dirt as everyone pulls their shoes off. The large baskets under the shoe shelf can hold extra shoes or accessories like winter caps and gloves. 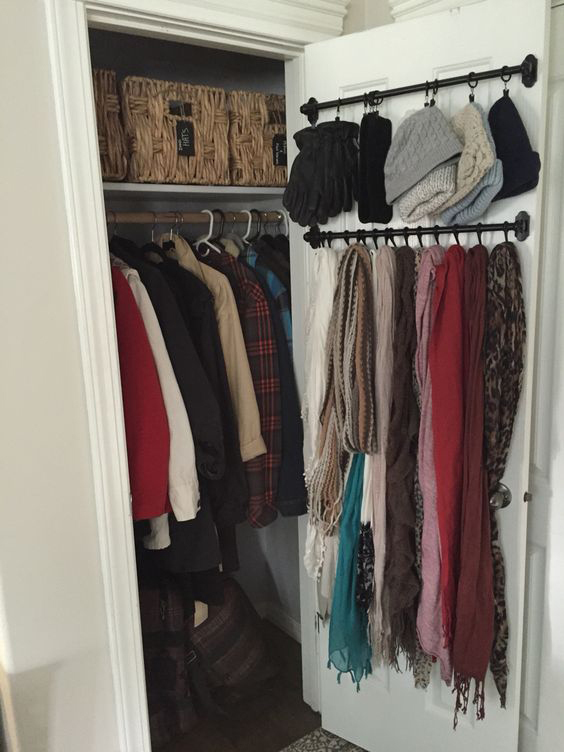 Install towel racks and hooks or shower curtain rings for scarves and other winter wear. What a great way to make use of the door space that’s so often neglected! 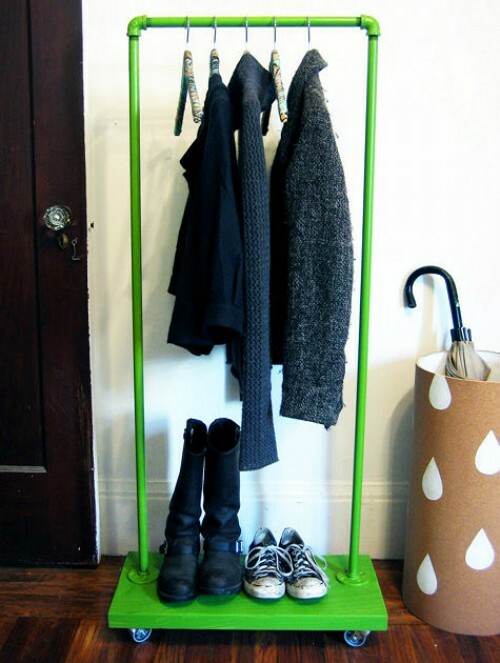 Hang your umbrellas on command hooks so they’re always handy as you walk out the door on a rainy day. Shoe shelves are a must, especially if you or your kids like to change shoes frequently. 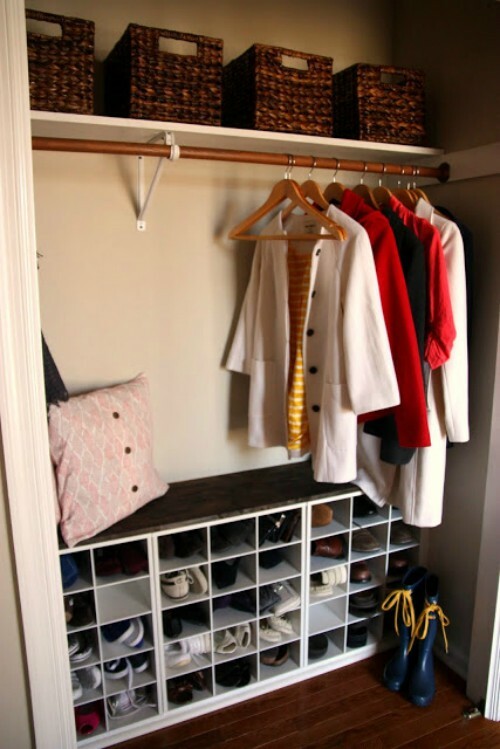 With two or three runs of shelving, you’ll have space for everyone’s shoes, including boots. 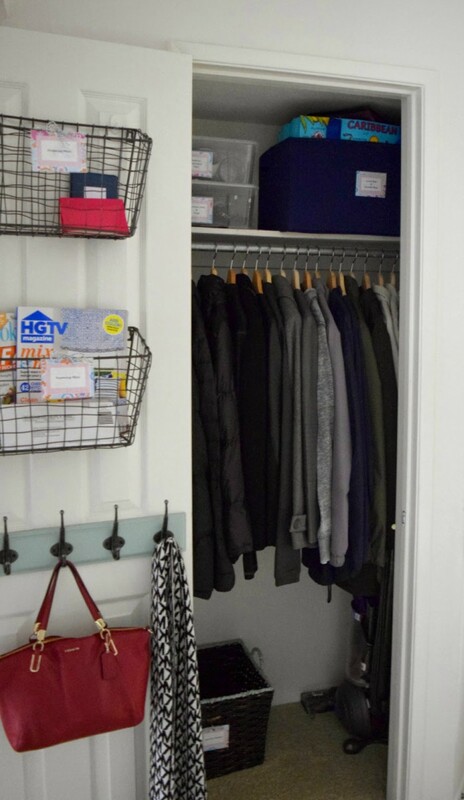 Spray paint your coat hangers to give your coat closet a little more colorful. 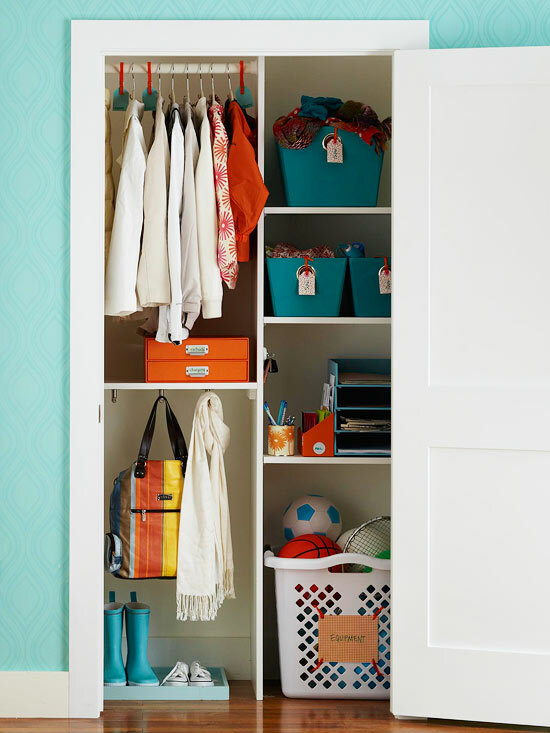 Hey, it may not be an organizing tip, but having a pretty closet will make you smile every day. 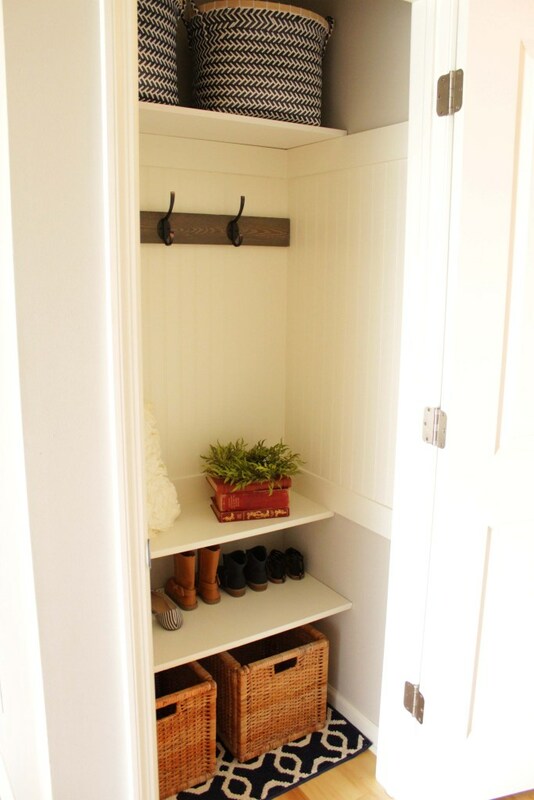 The coat closet is a handy place to keep your gift wrap if you can spare the storage space. 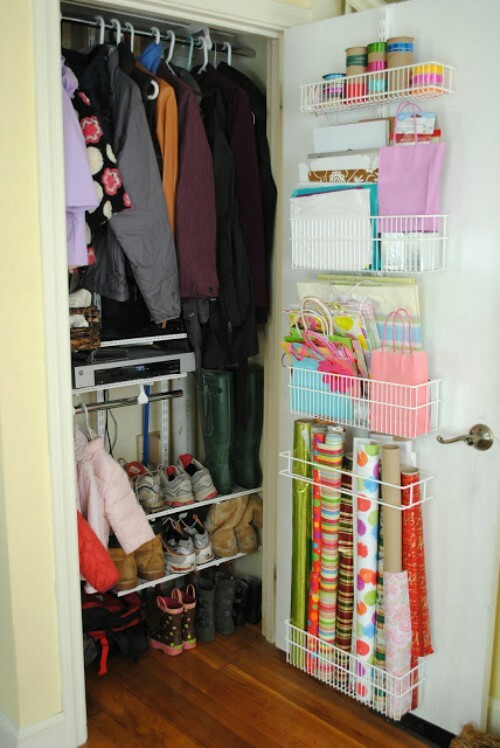 Wire racks and organizers on the inside of the door keep tubes of paper, gift bags, and tissue paper neat and tidy. 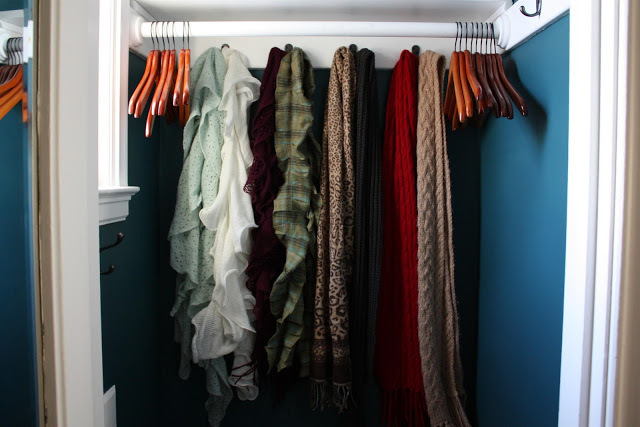 One clever organizer added four large hooks behind the coat hangers to hang and organize scarves. I like this idea because it puts them out of the way, but it may be a little difficult to sort through your scarves if your closet is crammed full of coats. 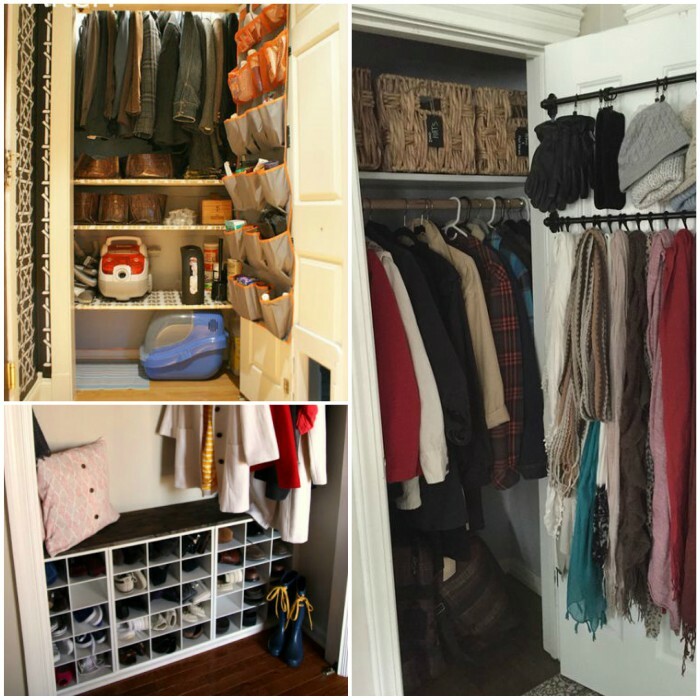 You have to click through to see the before and after for this coat closet. 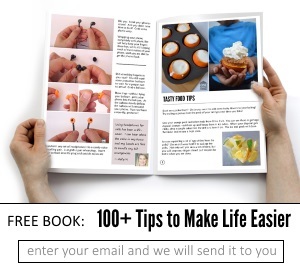 The before picture shows so much unused space, and the after, well… they’ve maximized every inch of space. From the shoe organizer on the door to the added shelves, so much can be done in this space. 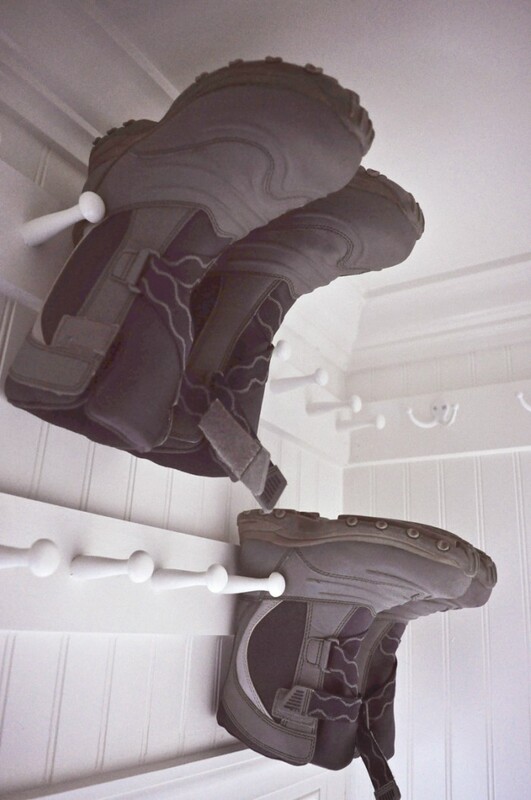 Install shoe pegs all around the closet to get shoes up off the floor. Don’t be afraid to change your shelving around. This modified shelving unit allows the homeowner to utilize much more space, even allowing room for the vacuum. Although it looks totally custom, this closet with shoe cubbies uses store-bought cubbies and adds wood and trim to make them look like a built-in unit. Look how many shoes it can hold! A hanging magazine basket is perfect for giving each child his or her own space for winter accessories. And narrow wire baskets are the perfect size for storing flip flops and small canvas shoes. 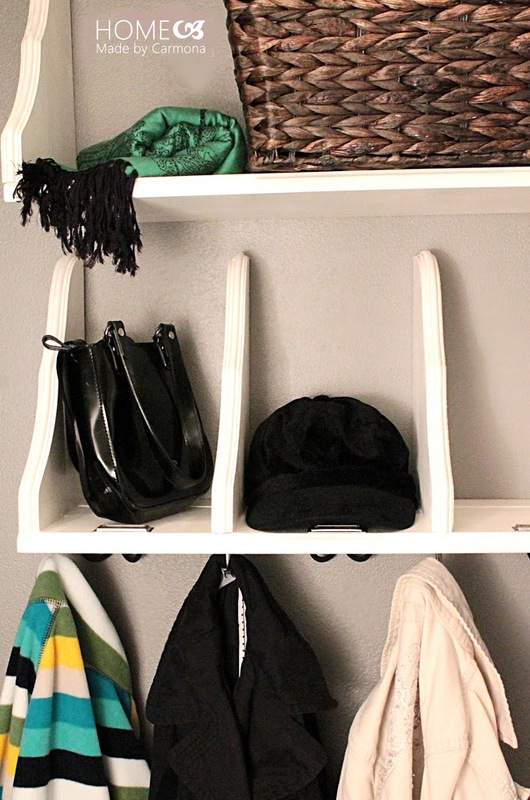 Create cubbies for purses and accessories by flipping shelves with brackets upside down. 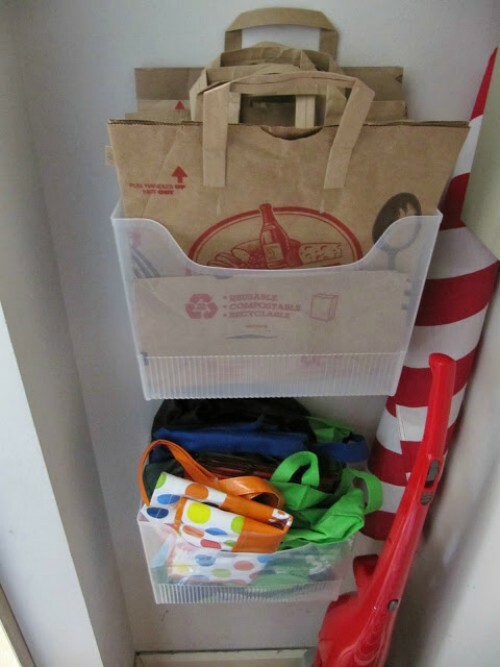 Attach file boxes to the wall to hold your reusable shopping bags. It’s much better than my idea of stuffing lots of bags into one bag. 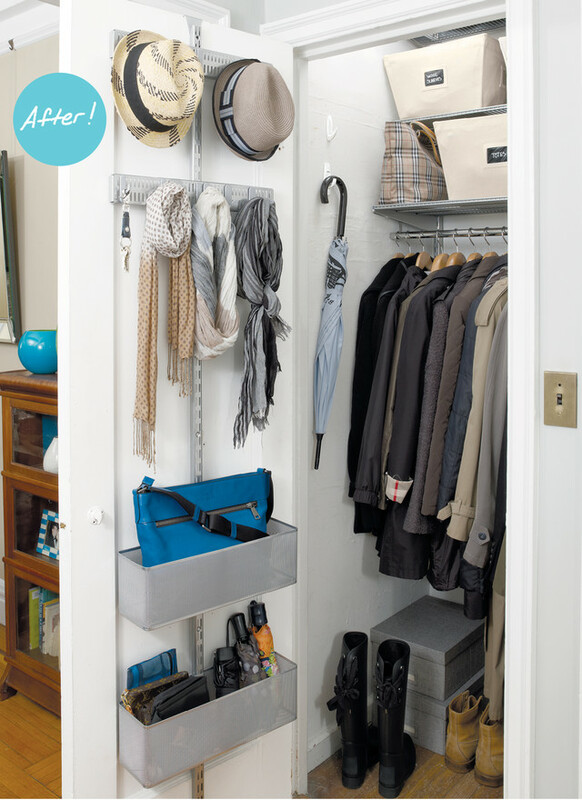 Create zones with a closet organizer that segments your closet into separate areas. Isn’t the laundry basket for sports equipment brilliant? 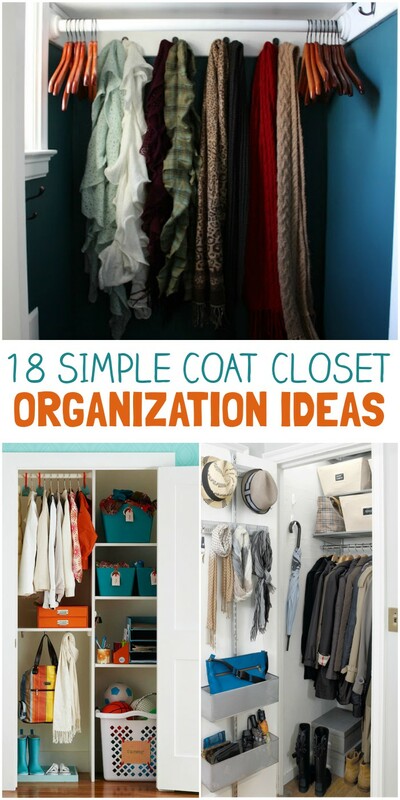 And, finally, if you don’t have a coat closet, there’s no reason to fret. 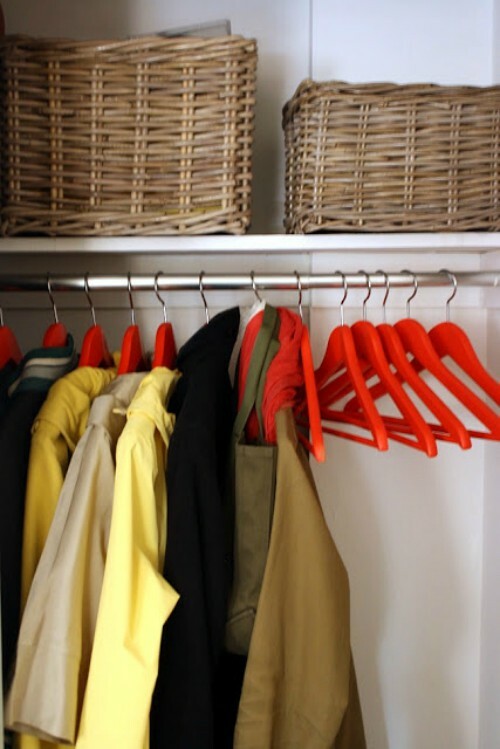 A rolling coat cart can provide the same storage options but with the benefit of being able to roll it in another room when you have people over. 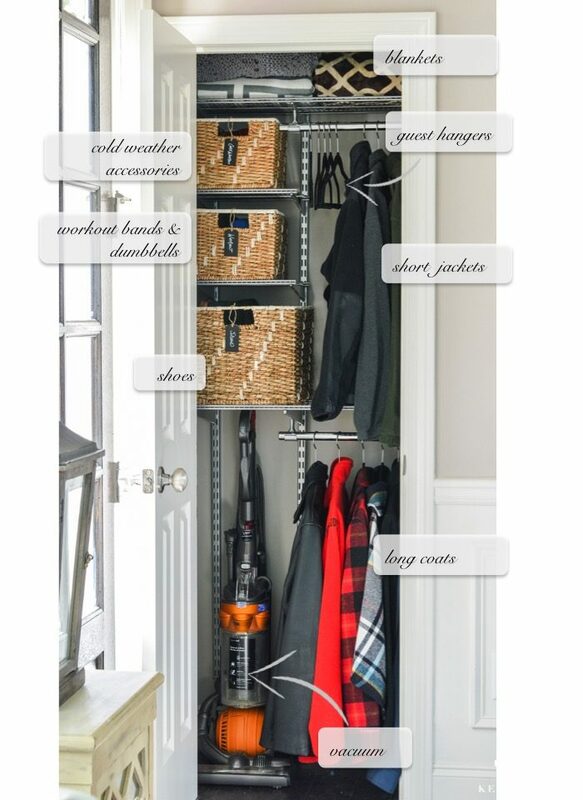 With these coat closet organization ideas, your morning routine will be so much more efficient!